This is a web log (or "blog") that I wrote during the summer of 2002.
and updated some of the links. I am starting this web log as I see this country slipping silently into Fascism. (The word Fascism gets abused a lot, but if you look at the link, the system described there looks a lot like Bush-Ashcroft America. I don't think we are there yet, but there's a road...and we're on it.) I am aware there is a growing protest movement, but it is nowhere near critical mass. Even before the current administration took power the government was being sold to the corporate world. Treaties such as NAFTA are making national governments obsolete except for keeping their local populations under control. The 9-11 events played into the script. The administration has used it as an excuse to launch an aggressive militaristic policy in world affairs exploiting our ability to use overwhelming force to dominate the world's energy resources. At home the population is being subjected to increasingly totalitarian controls, beginning at the margins, with the undercutting of civil rights and fundamental freedoms. Who would have thought that in this country we would ever allow indefinite detention of people without charges and without even lists of names released. People are literally "being disappeared" into the so-called anti-terror system. What is as frightening as the events is the passiveness of the population. I see this log as a chronicle of my perception of events as they happen...things are degenerating too fast to be able to make a mental tally going back even a few months. A friend recently asked "What was so wrong with the Reagan administration?" Where could I even start? I don't want to be left without my notes when my grandchildren ask what happened in these times. What this log becomes I can't really say up front. It will emerge. Last week the Bill Moyers, NOW program featured the fight over water privatization in Bolivia. One of the things mentioned, in passing, was that the CEO of the water firm (a subsidiary of Bechtel) said they might sue for lost future profits. They put no more than $1 million into the country before Bolivia reneged on the contract, which, by the way, guaranteed the company 15% profit for 40 years. 15% of what they might have made had the water project been completed calculated over 40 years is a rather unimaginable sum for a poor country to pay. The deal wasn't a free choice for Bolivia in the first place. The World Bank made privatizing water a condition for bank loans. There was only one bidder. It will be interesting to see how this all plays out over time. No wonder the trade summits are being held in secrecy and being picketed. "A sower went out to sow. And as he sowed, some seeds fell along the path, and the birds came and devoured them. Other seeds fell on rocky ground, where they had not much soil, and immediately they sprang up, since they had no depth of soil, but when the sun rose they were scorched; and since they had no root they withered away. Other seeds fell upon thorns, and the thorns grew up and choked them. Other seeds fell on good soil and brought forth grain, some a hundredfold, some sixty, some thirty. He who has ears, let him hear." The interpretation that follows the story in the Bible (and in most sermons) focuses on the different kinds of soil: we should be open to the Gospel and avoid the various pitfalls that would prevent the seed from sprouting. I learned in seminary long ago, however, that the explanations following the parables in the Bible were added much later and often miss the true point. Gandhi said something to the effect, "What you do may seem insignificant, but it is very important that you do it." In Nicaragua in the '80s the saying was "Revolution is the work of ants." The Gospel for today is encouragement to speak the truth. Those who have ears will hear. The Sydney Morning Herald (Monday July 15, 2002) reports that the GWBush administration is planning to launch a massive informant program involving the recruiting of as many as 1 in 24 private citizens. "The Terrorism Information and Prevention System, or TIPS, means the US will have a higher percentage of citizen informants than the former East Germany through the infamous Stasi secret police." A distant, improbable scenario? "A pilot program, described on the government Web site www.citizencorps.gov, is scheduled to start next month in 10 cities, with 1 million informants participating in the first stage." So...You engage in "controversial" behavior, because you have this incurable addiction to thinking for yourself. (Woe to you if, in addition, you don't happen to have Aryan ancestry!) Your wacko neighbor accuses you of being somehow involved in terrorism. You don't get a trial because terrorists don't deserve trials. You disappear into a secret detention system. They claim that even acknowledging you are being held would somehow violate national security. Your lawyer is accused of aiding and abetting a terrorist. Nazi Germany? Stalinist Russia? A bad dream? No. Everything in the preceding paragraph has happened here in the United States, land of the free, within the past year. Why did we bother fighting World War II? THE WAR AGAINST TERRORISM is the political equivalent of a stock market bubble - hope, hubris and hyperbole parading as fact. We have learned nothing since September 11: we are more belligerent, jingoistic, imperialistic, and anti-Muslim than we were before. We have thus accentuated the very conditions that led to that disaster and are now fully invested in our own myopia. The price of this error could be enormous. The alternative is to dramatically change our policies and our way of speaking of them. There is no possibility of our politicians doing this willingly; hope lies in a broad, nonpartisan, pro-democratic, pro-decency, pro-constitutional coalition of conscience. Those who profess to provide moral leadership and who enjoy access to the media could still accomplish this if they chose. But time is running out. [Doorbell rings]...Hello, we're Jehovah's Witnesses. Do you read your Bible regularly? [Me]...Do you have a warrant? What is a "secret law" in a "free society"? Check out http://cryptome.org/gilmore-v-usa-faq.htm for a very good explanation of what's behind a significant lawsuit some might initially see as frivolous. John Gilmore (one of the founders of Sun Microsystems) is suing Ashcroft over being ID'd at airports. The criteria for selecting who to search or who to deny the right to air travel is secret! If they tell you you can't fly, then you can't fly! Check out the link. It's really interesting reading. It's a bad idea to screen everyone passing through an airport to see if the computer identifies them as a potential terrorist for the same reason it's a bad idea to screen everyone for drugs. These may seem counterintuitive to a morally scrupulous, insecure general public but it's another example of how mathematics weasels its way into public affairs. The problem is false positives. Say you are screening 287,562,756 people trying to find 1000 potential terrorists. Say the criterion for screening gives a false positive reading 1% of the time. That means you are affecting the lives (arresting, delaying, falsely accusing, denying air travel to, making life miserable for) of nearly 3 million innocent people in order to try to catch 1000 people you think may be have evil intentions. Meanwhile, the actual terrorists are undoubtedly carrying false ID, and quite possibly have friends in high places, so they walk through unimpeded. All of this is even assuming no one is playing politics with the screening criteria...a major bad assumption. The same mathematics explains why they don't vaccinate the whole population for smallpox anymore. The chance of catching smallpox is very slim, even with the possibility that some nut may start sending out letters laced with smallpox virus. The danger of dying from the vaccination is small, percentage-wise, but a small percent of a large population means you would be killing a lot of people with a massive vaccination program...a lot more than were killed in the anthrax attacks. Screening large populations for small numbers of targets with screening techniques that can yield even a small percentage of false positives is bad practice, mathematically. It doesn't work well regardless of the emotional appeal of the issue involved. A totalitarian government, of course, doesn't care how many innocent people are hurt along the way, which is why military checkpoints on roads are a standard cinematic technique to symbolize totalitarian rule. Our society isn't supposed to be that way. The health community figured all this out long ago. They should share their wisdom with the Ashcroft Justice Department. More to the point, we should learn the math ourselves and use it to stand up to the Justice Department, which obviously doesn't care how many innocent people are hurt along the way. Off to Pacific Yearly Meeting (of the Religious Society of Friends)...a week away from the Internet. I noticed GW Bush is off for a month's vacation...too hot in Washington, in more ways than one. The week started with reports of five major initiatives by individuals. These set the tone for the entire week. Rachel Fretz of Santa Monica Meeting went to Burundi to help form and train trauma healing teams in the middle of ongoing war between the Hutu, Tutsi, and Twa ethnic groups. Sandy Farley of Palo Alto Meeting went to Kosovo and Albania, worked with children, introduced the AVP (Alternatives to Violence Program), and helped establish a microlending bank on the Grameen model. 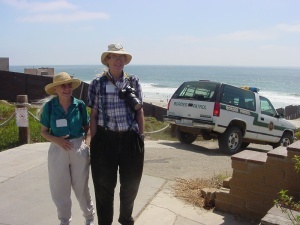 Janet Riley of Central Coast Preparative Meeting and John Helding of San Francisco Meeting introduced AVP to several California prisons and have established an ongoing AVP program at California Men's Colony. Carin Anderson and Chris Moore-Backman of Chico Meeting have been doing human rights accompaniment in the Peace Community of San José de Apartadó, Chris as a representative of FOR (Fellowship of Reconciliation) and Carin in a supporting role. The violence comes from three directions: the US backed Colombian military, the right-wing paramilitary (consisting often of off-duty, out of uniform military and police), and left-wing guerrillas. The Peace Community posts notices around its perimeter that it is unarmed, that it intends to remain neutral, and that it does not provide information or support to any of the parties of the violence. The theory is that having an international presence in the community raises the stakes for groups to attack the community. Attacks have happened, nonetheless, but no international workers have been killed yet. Another project that is ongoing, presented in an interest group later in the week, was the San Diego Street Light, a street newspaper founded by Forrest and Anne Curo and currently edited by Rocky Neptun, all of San Diego Meeting. The paper contains articles relevant to homelessness, employment and economics, labor issues, border issues, etc. It is given to homeless people to sell on the street for $1 (in lieu of pan handling), which they get to keep. It is estimated that every $50 invested in this project becomes $500 of financial aid to the homeless while it provides constructive activity to unemployed people and raises the consciousness of those who buy the paper. They published a version of my L-Curve article a year ago. What I didn't know about was the North American Street Newspaper Association (NASNA), which acts as a kind of "wire service" to channel articles to papers like this in "47 cities across the United States and Canada." I may submit articles from time to time! 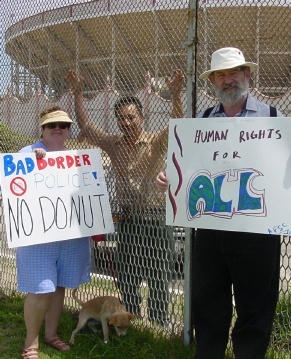 On Friday of Pacific Yearly Meeting in San Diego we did a border vigil. In a general sense I believed that there is something fundamentally wrong when you put up a highly militarized border, but the issues were vague for me at first. This was to be a learning experience for me as much as an opportunity to "make a statement." Driving toward the border you leave San Diego behind and the population density thins out. Then on the distant hills you see a huge expanse of dense third world construction. From east to west it goes on as far as the eye can see. The northern boundary is a sharp line with a big ugly fence. We have a state park, believe it or not, right on the border and extending out to the beach. It must be the most underutilized state park in California! It was empty, except for our caravan and a scattering of border patrol vehicles. The fence itself is a monstrosity. It's an ugly, hack job, but a very expensive hack job, I'm sure. Each section must cost thousands of dollars, and it's a long way to the Gulf of Mexico! It goes right out into the surf, which is a joke, because anyone who could swim could get around it. 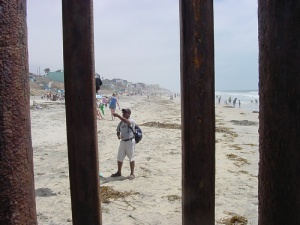 No need, however, because even while we were standing there several people came through holes in the fence and socialized with us on our side of the border as the Border Patrol looked on through their binoculars. 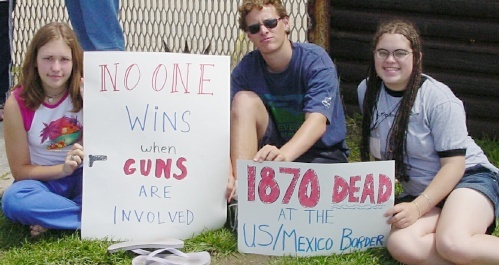 ... except for the Border Patrol who appeared thoroughly agitated by our presence. 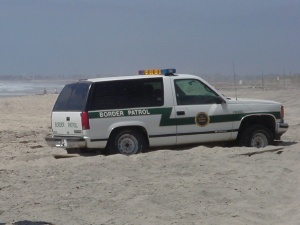 One tried to bring his vehicle down onto the beach and got stuck in the sand. I tried to pose two Friends by another of the vehicles, but he literally burned rubber trying to get out of the picture. I'm surprised the smoke doesn't show! We were careful not to touch any of the vehicles or personnel, and we were not physically harassed. We could go right up to the fence and talk to people on the other side. [They are talking about running three fences in parallel, which would eliminate this contact. I'm surprised nobody has proposed land mines.] Talking through the fence we met some interesting people with some interesting stories. One teenage boy went through high school in Idaho, where his family still lives. He was visiting a friend in California, got stopped by the INS, and was deported. Everyone wanted to know why we were there. The best one-liners I could come up with were that we believe in human rights for all, that everyone is of equal value, and that we should live as neighbors not enemies. One man on the other side, when I showed him the digital pictures I took, said it made him look like he was in jail. That's a good point. 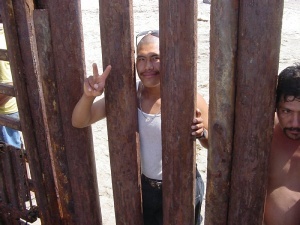 With a fence between two countries, which side is the jail? What's the essential difference between East Germany impeding the "right" to travel across a border and the US impeding a "right" to travel across a border? Is crossing a border a right or isn't it? Should it be? NAFTA establishes the right to freely move capital across international borders because that benefits the rich (at the expense of the poor). Yet we block the free movement of labor because that might benefit the poor at the expense of the rich. The rich are great believers in a deregulated market...when it suits them. Within the US we have an established "right" to freely move across state borders. That allows migration to act as a pressure valve when things go bad somewhere. During dustbowl days lots of families from Oklahoma came to California, but Oklahoma wasn't vacated and California's economy wasn't sunk. Things just came to a natural equilibrium. As long as jobs are available at a wage that is attractive to Mexicans but not US citizens, Mexicans are drawn into the US, to our mutual benefit. But by artificially restricting the flow we encourage an influx of undocumented workers, bringing with it a two-tiered society and all kinds of secondary problems. A free flow of labor would provide a more just and humane solution. Let them come; let them go; recognize their human rights; treat them as we would want to be treated. I am most acutely aware of the contradictions and hypocrisy of immigration as it relates to labor in California. We act as though immigration is a threat, but actually we depend on it for cheap labor...cheap exploitable labor is closer to the truth. We haven't really kicked the slavery habit. We need dark skinned inferior peoples in our economy to do our grunge work, but we don't want to socialize with them or let them share in the benefits of their labors. Exploiting "illegals" is cheaper than slavery. We don't have to feed them, guard them, or provide medical care. Instead of having to worry about slave revolts, we make them fear the INS. Now, with NAFTA, we can have our slaves and not even let them into the country! They slave for us on their side of the border where we don't even have to think about them. Why is our border with Mexico so different from our border with Canada? It seems to be part racism and part economics. Canadians are like "us", us being rich white folks, ignoring those of us who aren't. Mexicans clearly don't have what it takes to pull themselves up by their bootstraps and become like us, or so the racist logic goes. Another issue that is very real is physical abuse of border crossers by the INS. Most of the encounters are out of view of witnesses, and macho guys with high tech toys can get out of hand at times. According to the people on the other side the worst offenders are Tejanos...Mexicans hired by the U.S. border patrol to keep other Mexicans out. They said they operate on a bounty system, and they are the most prone to be physically abusive. Interesting how it works. I went to the border trying to put my finger on just what the issue was...but instead I realized there is a whole constellation of issues. Oh yes, one more thing. 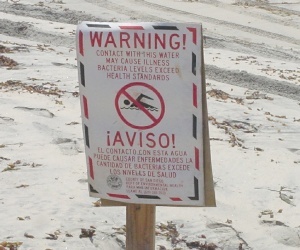 There was a sign posted on our side of the beach. 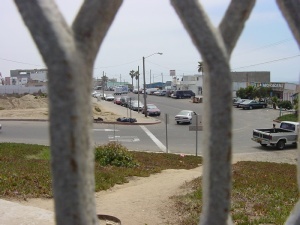 The river that flows into to the sea in Tijuana is the most polluted in the western hemisphere, due to the machiladora factories. Now think back to all those families having a great time at the beach. I found a wonderful book: "A Force More Powerful: A Century of Nonviolent Conflict". It follows the history of nonviolent struggle in the 20th century and concludes that apart from any moral or ideological considerations, nonviolence is often the most effective means for an oppressed group to overcome the oppressor. It is often the case that as soon as a conflict becomes violent, it runs into trouble. At that point it strengthens the hand of its stronger adversary and alienates potential allies. The book lists 12 successful nonviolent struggles of the 20th Century. How many could you list? The first item in the book is the 1905 uprising in Russia that preceded the bloody Russian Revolution. It achieved notable successes and fell apart when it turned violent. Gandhi was beginning his formative work at the time and used the Russian experiment as his explicit model. I have read the first two chapters (Russia in 1905 and Gandhi) and am in the middle of chapter 3 on the Solidarity movement in Poland. I'm learning a lot and growing to appreciate the strength of what is often denigrated as a weak option in real-world politics. The book was also made into a documentary for PBS, but I haven't seen the video. In searching the web for information on the video I found this interesting website with 198 forms of nonviolent protest. At the time of this writing you can order the 2-video set for $39.95. It is late at night, so I haven't called yet and I don't know how current the price is. (Monday morning: Yes. Price still valid; video still available; bought a copy. "Today I resigned from the staff of the International Monetary Fund after over 12 years, and after 1000 days of official fund work in the field, hawking your medicine and your bag of tricks to governments and to peoples in Latin America and the Caribbean and Africa. To me, resignation is a priceless liberation, for with it I have taken the first big step to that place where I may hope to wash my hands of what in my mind's eye is the blood of millions of poor and starving peoples. Mr. Camdessus, the blood is so much, you know, it runs in rivers. It dries up too; it cakes all over me; sometimes I feel that there is not enough soap in the whole world to cleanse me from the things that I did do in your name and in the name of your predecessors, and under your official seal." Newsweek, Aug. 19 issue / Word spread quickly through the Charleston Naval Station last June: a big-time terrorist was headed for the brig. An entire wing of the base's military lockup was emptied out. And when the prisoner arrived, 31-year-old Jose Padilla, he was placed in an isolation cell with a lamp burning 24 hours a day and a phalanx of guards around the clock. One inmate asked a guard what exactly Padilla had been charged with. "He's not charged with anything," the guard shot back. "We're just holding him." The prisoner was baffled. "How the hell can you do that?" he asked. Quite easily, it turns out. Attorney General John Ashcroft publicly accused Padilla, a.k.a. Abdullah al-Muhajir, of being a Qaeda operative who was actively "plotting" to set off a radiological bomb when he flew into Chicago's O'Hare Airport from Zurich four months ago. Inside the U.S. intelligence community, sources tell NEWSWEEK, there were high-level doubts about Ashcroft's dramatic announcement of an ongoing plot from the very beginning. But those views received scant attention at the White House, officials say. After a hastily signed finding by President George W. Bush that he was an "enemy combatant," Padilla was removed from a New York jail and flown to the Charleston brig in early June. He's been held there incommunicado ever since, with no charges pending against him and no prospect of a trial or court hearing where the government's evidence can be tested. Last week authorities told NEWSWEEK they're not even interested in making a case: they want to force Padilla to tell what he knows about Al Qaeda. Perseid meteor shower last night. My friend "Juan" and I lay out on lounge chairs on the deck until about 5 am looking up and talking about things...theology among them. He was coming from a sort of functionally atheistic position (but not, as he clarified, to be taken as an assertion of knowledge that God does not exist: an assertion he would say is just as absurd as a claim of knowledge that God does exist). He derives an ethic based on his own perspective with no reference to God. On the face of it his sense of values is largely in agreement with my own. His primary reason for rejecting religion, of all kinds, is its power and historical tendency to recruit true believers to perpetrate evil on almost unparalleled scales...bigotry, crusades, inquisitions, genocides, etc., not to mention fraudulent money raising by T.V. preachers. He calls religion a "dangerous weapon" in the hands of small-minded people. I entered the discussion from my evolved Christian/Quaker position that one might ferret out from my writings. Do I believe in God? Usually. I agree on the potential for evil inherent in religion, but I have a stronger sense of its power for good as well. We both acknowledge that my position, on most issues, is a lot closer to his than it is to many who stand under the umbrella of Christianity. One topic I shared with him that I have been exploring recently is the doctrine of salvation by faith vs. works vs. other takes on this topic. At the recent ordination of my brother-in-law into the Presbyterian ministry the doctrine of "justification by faith alone" was reiterated as part of the ceremony. Catholics, on the other hand, emphasize that salvation requires works as well as faith. I think this is what got me thinking on this topic. In my growing up years I frequently heard fundamentalist preachers speak on the topic, "What would you say to a person if you knew it would be the only chance you would ever get?" These sermons usually advocate asking if the person were saved and urging them to accept Christ if they were not. With these sermons in the back of my mind I have been struck by what Jesus said to the many people he met in short encounters. He never approached people in this way. With the Roman soldier in Matt 8:5ff, a Pagan most likely, he never urged any change in his belief structure. The soldier did most of the talking. Jesus listened. When the soldier left, Jesus held him up as a positive example to the religious people around him without ever attempting to convert him to anything. Whenever Jesus talked about what one must do "to be saved" or "to enter the kingdom of God" or "to inherit eternal life" it was generally in response to direct questions and in terms framed by the questioner (cf. Mark 10:17ff). Ironically, during his ministry on earth, salvation didn't seem to preoccupy Jesus nearly as much as it does fundamentalist preachers. According to this text salvation is taken care of by God. It's a done deal. You don't have to do anything to earn it. Just "Believe"! That's the kicker. Fundamentalist preachers turn this "believing" into some kind of hoop you have to jump through to join the club. But what the text is really saying is, "Hey, salvation's taken care of. Believe me, it's a non-issue. Get off your knees and get on with life. 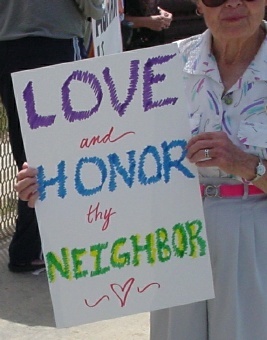 Your job is to transform this mess of greed and corruption, into a place ruled by the love of God." If you fail along the way, the message is, "Hey, don't worry. You're forgiven. Forget it. Don't get bogged down in guilt...get up and give it another go." When his disciples asked whether they should forgive a person 7 times he said they should forgive them 70 times 7 times. Presumably God, in his infinite mercy, would forgive even more freely. Those who put the focus on getting saved (whether by faith or by works) are turning the concept on its head. The Gospels are asking us to change our focus from salvation to discipleship. To truly believe that Christ has saved us is to let go of the quest for salvation. Perhaps Jesus sensed that the Pagan soldier had a head start. Salvation is neither by works nor by faith. It is an act of God. What is required of us is to rely on God to take care of the salvation question, and instead to turn our attention to transforming the world into the kingdom of God, making it "on Earth as it is in Heaven." What about my functionally atheistic friend Juan? John (1:9) talks about a "true light that enlightens every man." I would call it God. What does it matter what he calls it? I have been pondering the Perseid Meteor Night discussion on salvation. Even though the ideas were propounded by me, I hadn't completely worked them through ahead of time. Since then I have been pondering some of the implications. If the message of salvation is "don't worry about salvation" then what is the Gospel Christians are supposed to preach? "You need to be saved, but it's already a done deal, so don't worry about it?" I don't think so! Jesus came preaching about the kingdom of God. [Matthew calls it the kingdom of heaven, but that isn't because it's in heaven. It's because they had a taboo against using the name of God. They substituted heaven instead.] Jesus was preaching in the context of a land under Roman occupation. They were looking for a messiah who would overthrow the oppressors and establish a real kingdom. Jesus came proclaiming the kingdom of God has arrived, but it is a kingdom you can't draw on a map. It is like a mustard seed that grows into a tree that has roots and branches everywhere. It is like a grape vine. It is like leaven in a loaf of bread. It is like salt. The good news is the kingdom of God is here today, that it doesn't belong to the religious elites, that all those lost souls, the lepers, tax collectors, prostitutes, Samaritans, the poor--people proper society had pushed to the margins and left for dead by the side of the road--could be a part of it, and in fact would most likely wake up to the kingdom ahead of the rich and religious. The kingdom of God is wherever God is allowed to rule. It is among us and within us. It is a kingdom Rome can't attack or conquer because it is everywhere, yet it is invisible to those who don't have eyes to see. My log entries stopped suddenly over a month ago. No I didn't fall off the face of the earth: school started and I haven't had time to write. I'm going to take a few minutes tonight, but I can't go on too long. First, looking back at my last entry, the movie version of A Force More Powerful is very impressive! It has six half-hour segments on two tapes. The first is about the Civil Rights Movement of the 60's without being about Martin Luther King. It focuses instead on a single episode: the lunch counter sit-ins in Nashville Tenn. The thing that is so impressive about this effort is that it was so well organized, focused, and it brought major tangible results within the space of a single year. 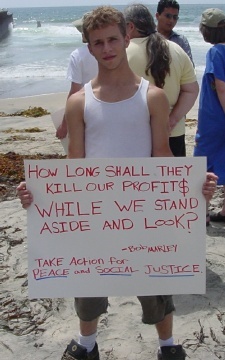 The idea is not to simply protest, but to accomplish a real change in society. This sense of focus and the possibility of actually achieving a victory seems to have been lost in so much of the protest scene. It really raises the question, what needs to be done to take back this country from the corporations? 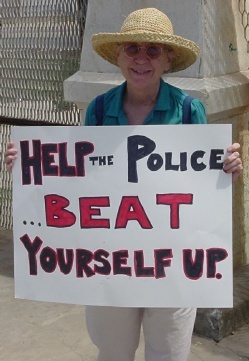 Simply protesting doesn't rate, although it may well be part of the overall picture. The other episode on the tapes that most impressed me was the last segment on the second tape: the ouster of Pinochet in Chile. For all of my interest and one-time involvement in Latin American issues, I wasn't aware of this movement. Was I asleep or was it just so ignored in the US press that you had to know somebody down there to realize anything was going on? In any case, the Chile episode alone is worth the price of admission. People told Gandhi he succeeded only because he was up against such a humane power, and that it never would have worked against a real dictator like Hitler. Here in Chile is a real dictator. Pinochet killed many thousands to stay in power. The populace was so frightened that people literally stopped talking to each other. How would you pull a population out of the doldrums like that to rise up and take their country back? We are going to be showing this film in Visalia on October 11. Anyone interested in seeing it either then or at some other time, contact me for details. 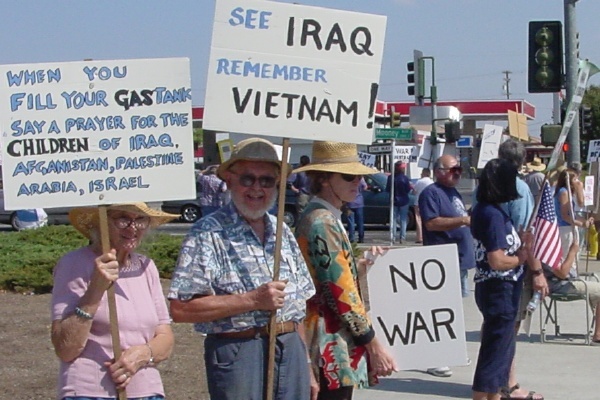 The other thing that is going on in Visalia recently is we have started having regular weekly antiwar demonstrations. We are meeting on Mooney and Walnut from 12:30 to 2:00 pm every Sunday. We started a week ago with 24 (on two day's notice) and doubled this week to 50. Twenty or so people is actually enough to make a favorable impression. I would like to see what 100 or more would be like. It is a great opportunity to talk to each other, as much as anything else. Is Bush as bad as Pinochet? He isn't killing very many people within our borders, but he is getting ready to go over the top in killing people outside our borders. If this little adventure in Iraq goes bad, Iraq could attack Israel and Israel could respond with nuclear weapons, breaking the nuclear taboo and destabilizing the world. Now we're talking about incinerating millions. The problem now, as in the Reagan era, is not the guy on the throne but the people who put him there. Gandhi's focus was not on getting rid of the British: it was on teaching India to be worthy of self-rule. This meant overcoming the caste system, overcoming bitter religious rivalry, and overcoming poverty, hunger, and a sense of dependency. For us it is learning to overcome our intellectual laziness and isolation.